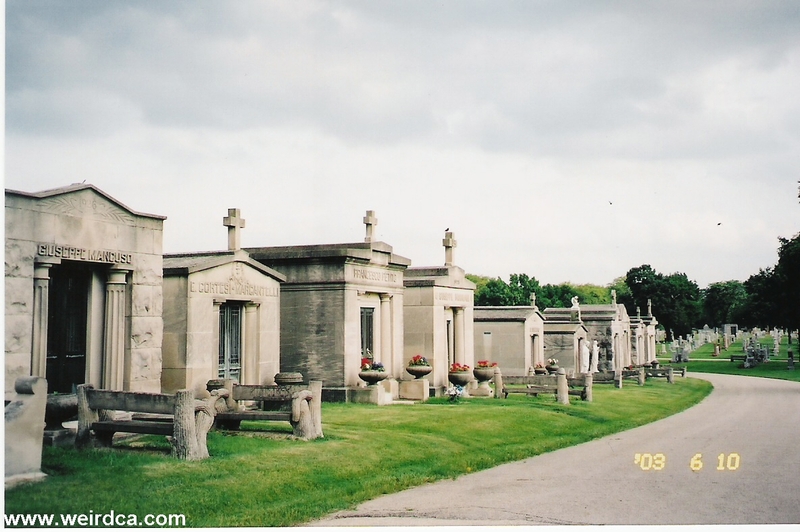 Home to several gangsters, Mount Carmel Cemetery lies in one of Chicago's suburbs. Born in Brooklyn on January 17, 1899, Alphonse Capone ran one of the most ruthless and legendary mobs from the Lexington Hotel in Chicago. Eventually arrested in 1931 for tax evasion, he spent much of his time in Alcatraz before being released in 1939 and retiring to Florida. He died there of syphilis on January 25, 1947. Originally he was buried in the Mt. 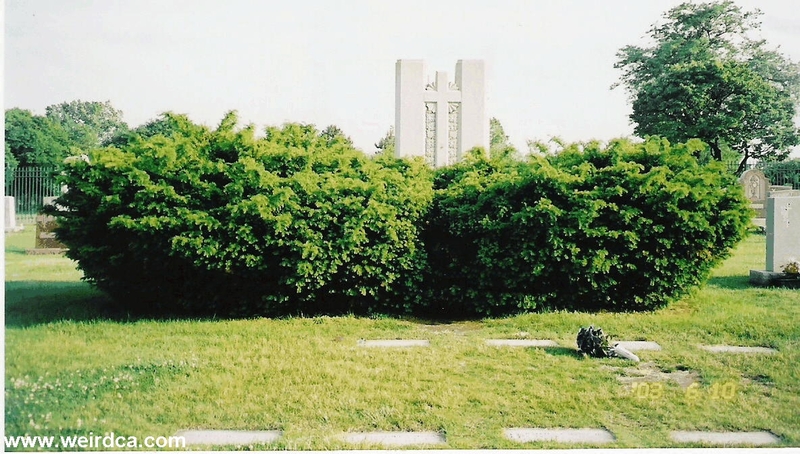 Olivet Cemetery, but after his mother died in 1952 and his current site was deemed too much of a tourist attraction, he was moved to Mount Carmel Cemetery. 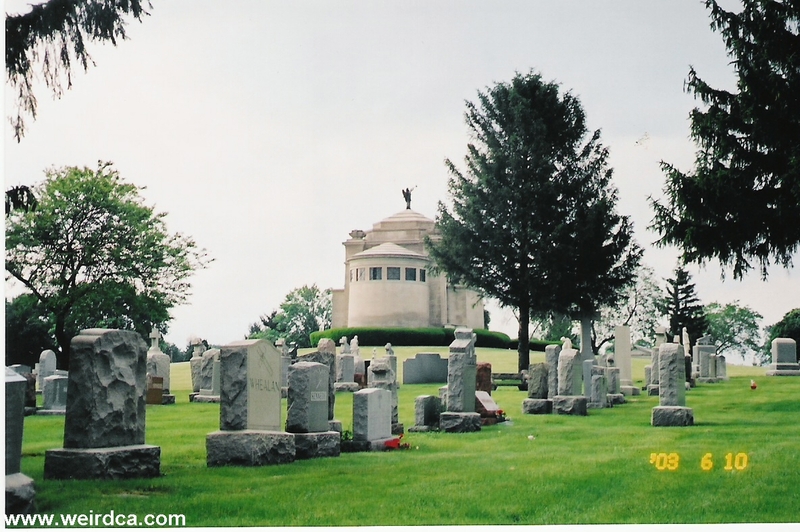 Mount Carmel Cemetery, located on 1400 S. Wolf Rd in Hillside was founded in 1900. This beautiful and immense cemetery hosts the graves for several of Chicago's most famous mobsters. Filled with intricate tombstones and hundreds of ornate mausoleums, the cemetery is am impressive site to behold. I easily got lost when I was driving around the site. If you stop by, I highly advise rolling down the windows, turning off the radio, and driving slowly down the several roads throughout the cemetery. Hillside appears to host no less than four large cemeteries, several within a few blocks of each other. There are so many people interred within the city, that near the entrance to the cemetery, I found several stores catering to the cemeteries needs including a tombstone decoration store as well as a florist specializing in floral arrangements for funerals and gravesites. 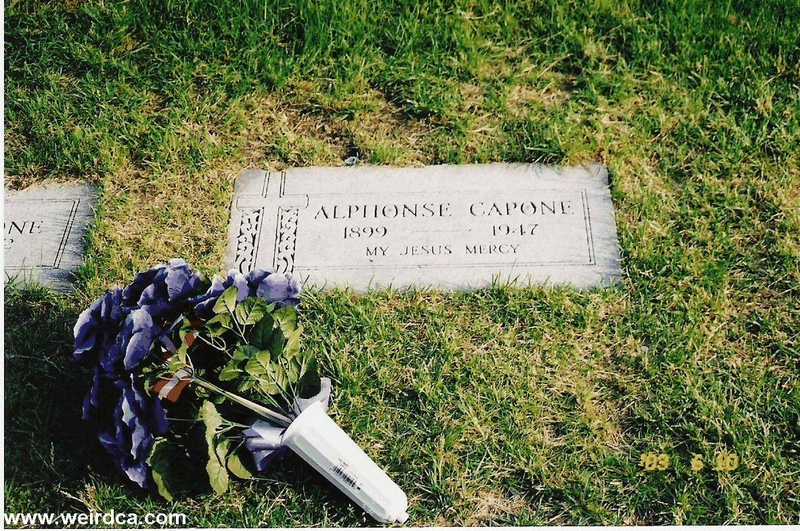 Upon entering off of Roosevelt Road, if you take the first right, you will come upon Al Capone's grave. 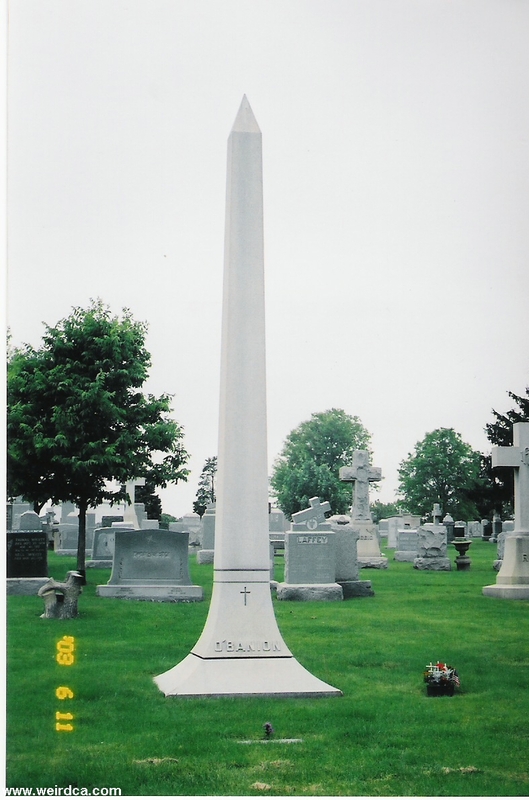 There is a tall stone marker for the Capone family, in front of which lies his tombstone, a flat marker bearing simply his name, years, and the words, "My Jesus Mercy". Often you will find gifts (flowers, alcohol, coins, etc) on the grave. It is rumored that if you show Mr. Capone any disrespect that his ghost will appear to chase you off. 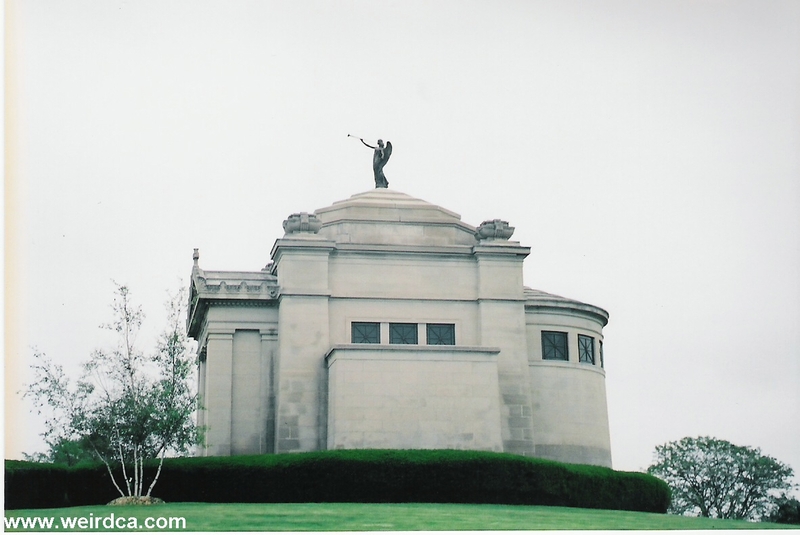 From the Roosevelt Road entrance, if you continue forward past the war memorial, you'll pass by the Genna Mausoleum. 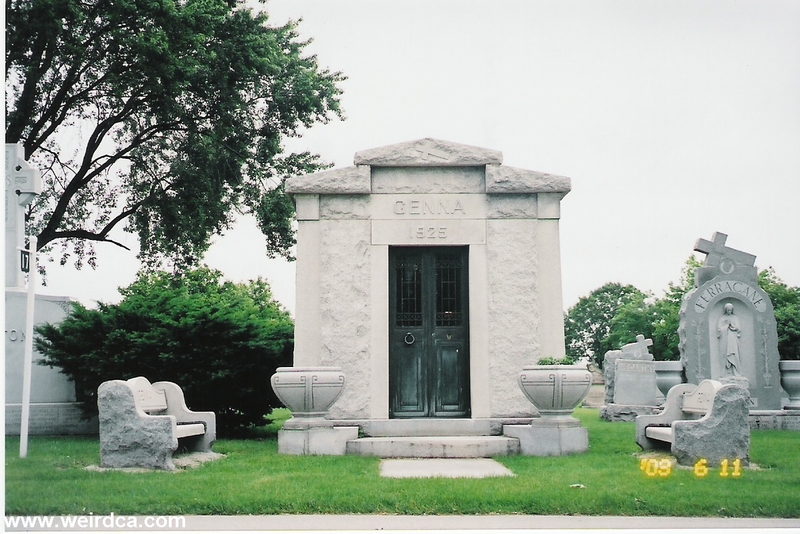 Several of the Genna brothers are interred here. The Gennas gang included Sam, Vincenzo or Jim, Pete, Bloody Angelo, Tony the Gentleman, and Mike the Devil. The Genna's basically made the mistake of getting involved in a three-way war between the O'Banion-Weiss gang and the Capone gang. Although involved with the hit on Dion O'Banion, both rival gangs basically picked the Genna's apart after the successful hit. Angelo was shot-gunned down and killed by several members of Charles Dion O'Banion's gang including Hymie Weiss, Schemer Drucci (both also interred within the cemetery), and Bugs Moran. Mike Genna was wounded by police while attempting to flee the scene of a shoot out with Moran and Drucci. He later died in the ambulance. Regardless, two of his own men would have killed him later that day, as two Genna enforcers, John Scalise and Albert Anselmi, had already turned traitor and gone over to Al Capone's mob. (Scalise and Anselmi were Sicilian hitmen who smeared garlic on their bullets hoping that it would cause gangrene). Tony was set up by one of his own men, Guiseppe "The Cavalier" Nerone, in much the same way that Mike the Devil, Scalise, and Anselmi had taken out O'Banion, with a handshake. A few days later, Nerone got his due as he was gunned down outside a barbershop. With the death of Tony, the Genna gang was mostly broken, the remainder members fleeing Chicago. Dion O'Banion led a feared gang of Northsiders including Hymie Weiss, Vincent "Schemer" Drucci, and George "Bugs" Moran. His anti-Italian slurs would eventually bring him the hatred of two other rival gangs within Chicago, the Torrio-Capone gang and the Genna gang. Formerly rivals, the Torrio-Capone gang and the Genna's immediately sided with each other when along with O'Banion's racial slurs, O'Banion also set up Torrio and arranged to have him arrested. Mike Genna, Scalise and Albert Anselmi soon entered O'Banion's flower shop and with Mike Genna shaking the Irish man's hand, the other two gunned him down. Angelo Genna played the part of the get-a-way driver. This single act, of course, started a major war between all three gangs with the Genna's being the first to fall. After O'Banion's death, Weiss took over the gang until Capone had him taken out a few years later in 1926. Weiss is also buried in a mausoleum in the cemetery. 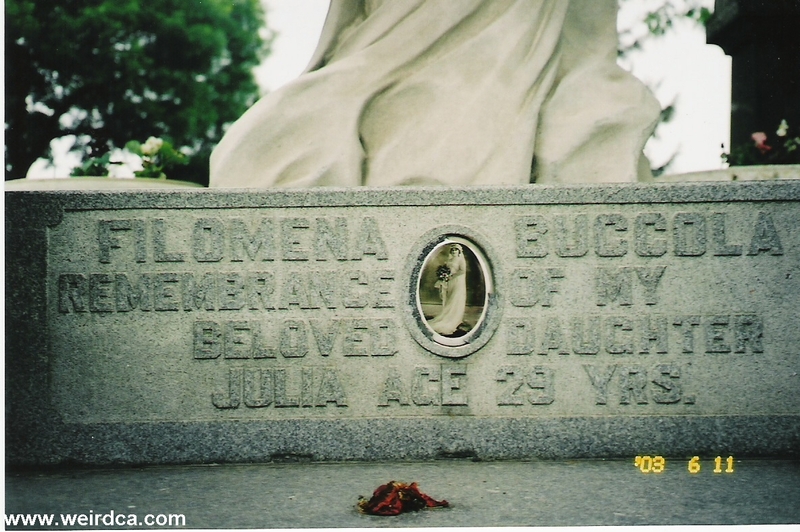 Drucci is also interred within the cemetery, although sadly I do not have pictures for either sites. Rumored to have killed over twenty-five men Dion O'Banion was refused a proper burial on consecrated ground by Cardinal Mundelein. 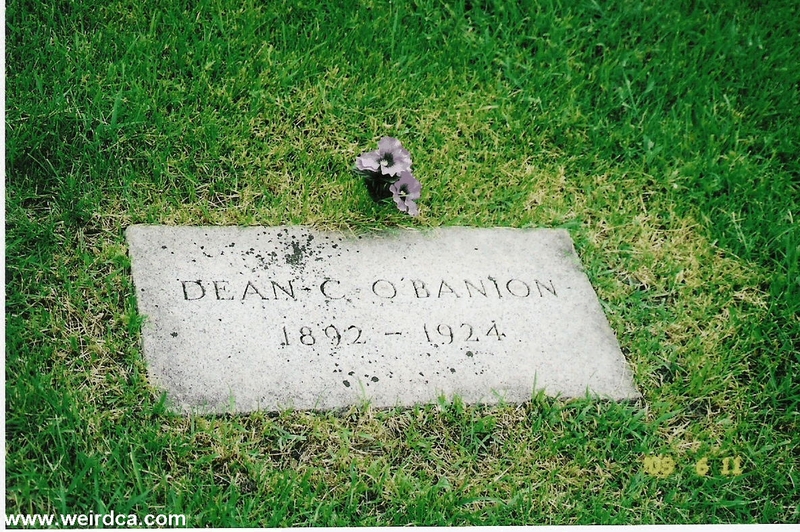 It took O'Banion's wife five months of pleading before he was moved to the cemetery proper with a shaft reading "My Sweetheart" placed over him. 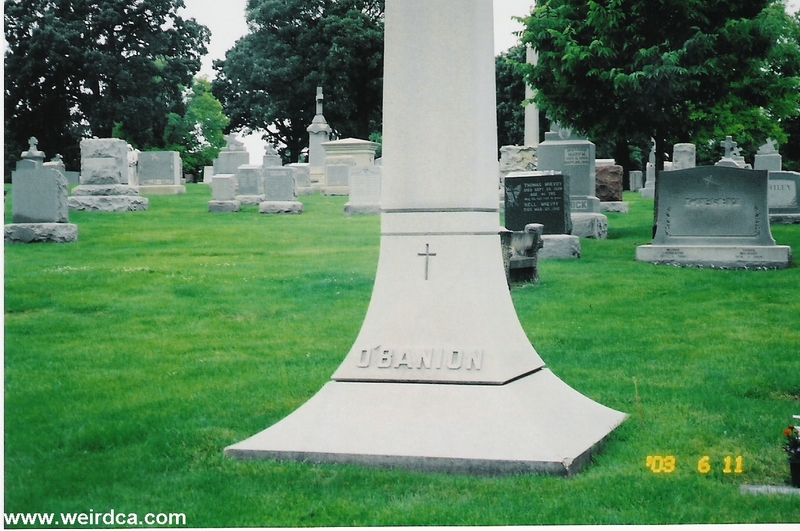 Cardinal Mundelein ordered the monument removed, but a later obelisk was later placed there and allowed to remain. Oddly enough his grave is right across the road from the Bishop's Mausoleum, one of the key areas and nicest of areas in the cemetery. 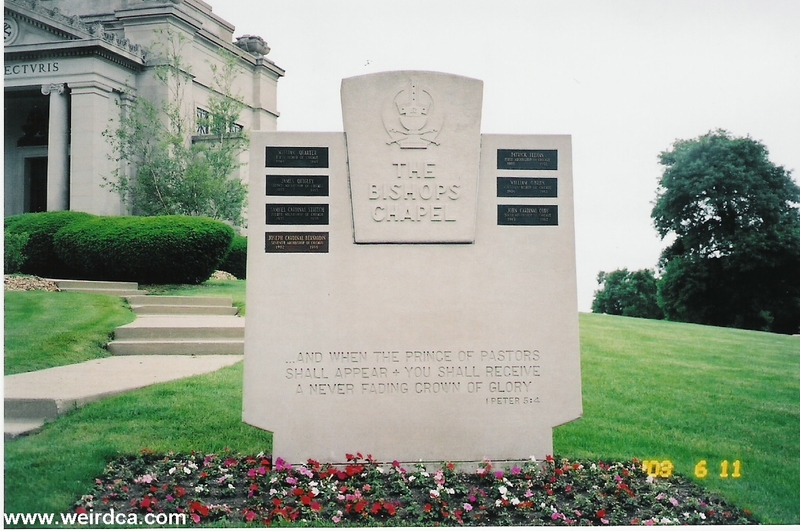 The Bishop's Mausoleum stands on a small hill approximately in the center of the cemetery. It has a small statue of the angel Gabriel on top of it. A beautiful and ornate mausoleum and easily one of the biggest structures in the cemetery it holds seven Cardinals, Bishops, or Archbishops. Archbishop James Quigley had it built between the years of 1905 and 1912. He was interred within in 1915. 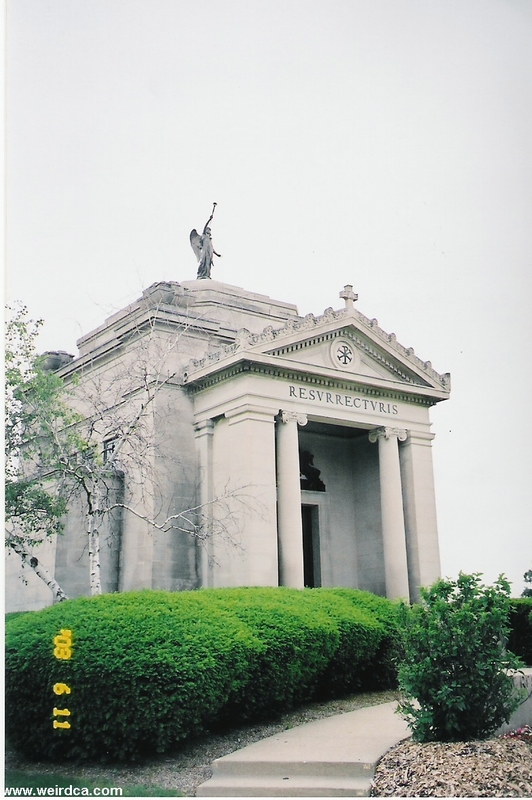 The mausoleum has the word "RESURRECTURIS" written above its door. 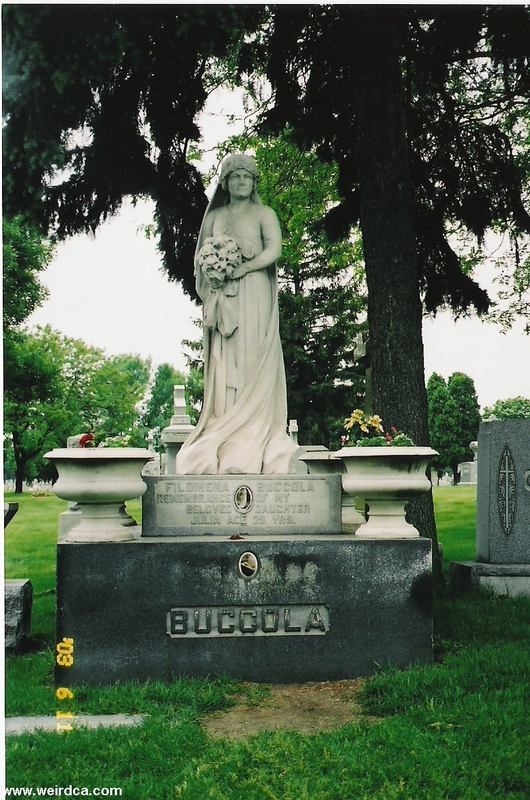 Besides Bishops and Gangsters, the cemetery does in fact hold ordinary people and one such grave is Julia Buccola Petta or "The Italian Bride". Julia died while in childbirth in 1921. She was only 29. During the next six years, her mother Filomena kept having dreams about her daughter. Eventually her mother was able to get permission to have her grave exhumed. Upon doing so, the coffin was found to be rotten and appeared to have gone through the six years of decay that it should have. Julia, however, was perfect in every way. She had not decayed a bit in six years. Well the gravesite has a life-sized statue depicting Julia on her wedding day, as well as two urns, all on top of a black pedestal. 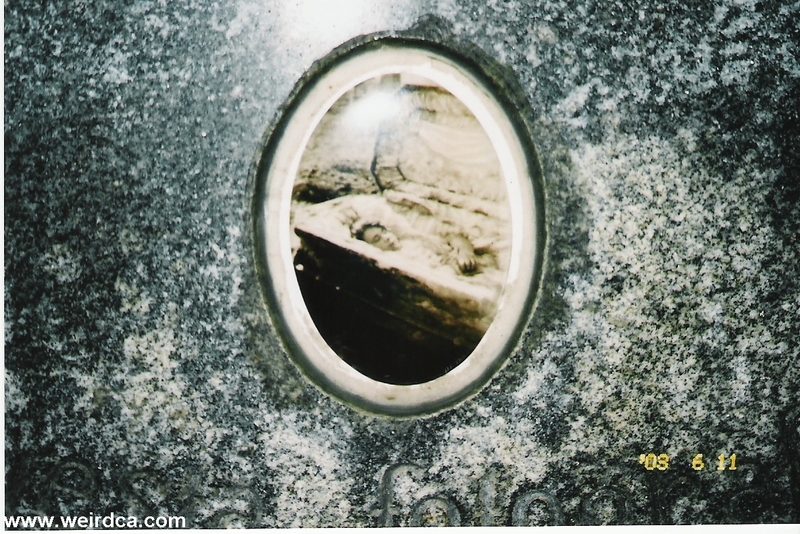 In the pedestal are two pictures; one showing Julia again on her wedding day and the other showing her after her grave was opened six years after she was buried. It shows her to be perfectly preserved although the coffin can obviously be seen to be decaying within the picture. Such bodies that don't decay are suppose to be incorruptible, a condition that several Catholic Saints are said to have had. Julia is said to wander the cemetery particularly near her grave. Motorists and pedestrians have reported seeing her from Harrison Street. She wears a white wedding gown as she goes on her way. Julia's tombstone can easily be found by entering the cemetery from Harrison Street and turning left. She will be the first tall statue of a lady on your right. I visited Mt.Carmel 7 years ago when I visited a Co. in Hillside. I traveled ftom Cleveland and loved taking photos and wanted to see the grave of Al and all the Chicago Gang members buried there. I took my photos but was drawn to this grave of Julia. I did not understand the photos on the monument or what occured. Did she die the same day ? When I got home days later and walked into the house, I found my wife watching a program on TV and talking about the Julia story! coincidence ? I do have many pics of her grave but still can't find the program or a video of it. Anyone know ?